Welcome to my family history and more! Some families know a great deal about their roots; others know very little. 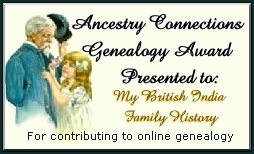 This site started out a few years ago as an attempt to record all I have learnt about my family history. In these modern times, families tend to be scattered all over the country, if not the world. One of the goals of this web site was to help my family stay connected even though we live far apart, but has developed into something much bigger than I had originally anticipated! This website now contains alot of transcription work that I did in my spare time. Some of the transcriptions are miscellaneous bits of information I have come across in old books or newspapers I have bought at auctions and the rest are bigger projects I did during my visits to the Oriental & India Office Reading Rooms. As this site has grown people have also sent in bits of information for me to include on this site. When this happens I have credited the sender next to the piece of information. I no longer have time to maintain this website since taking over as webmaster for the Families In British India Society (FIBIS) and any future transcriptions I do will be place on the FIBIS Search website. 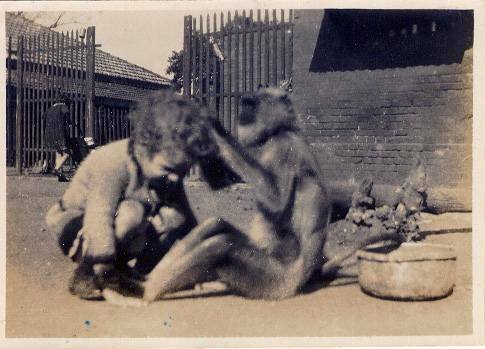 Have you ever wondered what happened to all your family and long lost cousins since you left India? My family lost touch with theirs when they left India after Independence. I have since found over a dozen scattered all over the world in Germany, England, Australia, USA, Canada and South Africa. It is amazing how easy it is to find people now that so many of us have access to the internet. Don't put it off any longer - find them! I would like to thank all the people who have helped and advised me with my research. Especially all the helpful people on the India rootsweb mailing list , Stephen Allberry, the Coode family, my Uncle Brian, Aunty Val and cousin Margot, but most of all my Grandmother for all her wonderful stories of her life and family in India that inspired the search to find my roots.